This week we couldn’t help but notice the the ad for Kraken Black Spiced Rum on the back cover of LCBO’s Trend Report magazine. The distinctive bottle, colour and label artwork really caught our eye, so when we saw it on the shelf tonight at the LCBO I knew we had to try it. The description of the black spiced rum speaks of hints of chocolate and molasses cut with vanilla, cloves and undercurrents of cinnamon. That’s a lot of tastes to absorb – we definitely get the molasses, vanilla, cloves and cinnamon – not so much on the chocolate, but we’re willing to keep trying until we find it. 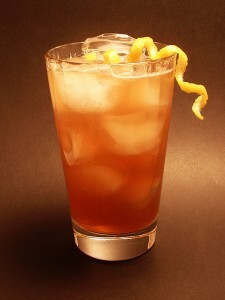 The feature was accompanied by a drink recipe for The Perfect Storm, a twist on the classic rum drink the Dark & Stormy. Here’s our slightly tweaked version. Combine the ingredients in a cocktail glass with 3-4 ice cubes. Shake, then strain into a high ball glass filled with ice. Garnish with a twist of lemon.